CK’s stand is that the internet is keeping the truly knowledgeable from being heard or seen, with the unwashed masses having an equal voice and few, if any, means of validating any information. What are the experts to do, then? To survive, those of us who believe that inexperience rarely leads to wisdom need to swim against the tide, better define our brands, prove our worth, ask to be paid for what we do, and refuse to climb aboard this ship of fools, the one where everyone has an equal voice. Google “broccoli casserole” and make the first recipe you find. I guarantee it will be disappointing. The world needs fewer opinions and more thoughtful expertise—the kind that comes from real experience, the hard-won blood-on-the-floor kind. I like my reporters, my pilots, my pundits, my doctors, my teachers and my cooking instructors to have graduated from the school of hard knocks. There are some who interpret Chris’ opinion as anti-internet. In fact, this post started as an anti-Kimball rant in response, but after I read the source I was inspired by the message I took away—wisdom comes with experience. I’ve been a fan of America’s Test Kitchen and Cook’s Illustrated for several years, mainly because of their scientific approach to food. Their Best Recipe cookbook is my go-to book every time and it’s the best gift for most home cooks I know. I trust their methods and I accept that they’re experts in what they do. That’s why I turn to them for most things instead of relying on the web for recipes that matter. That isn’t to say that there aren’t valuable resources to be found in other areas, with some surpassing the test kitchen’s recipes. Example: I made oatmeal cookies with my niece from the recipe printed on the lid of my favorite oats. It was easy to follow and, more importantly, they were spectacular. My wife mentioned how much she liked them and it’s a shame that we don’t make cookies more often, so I decided to make another batch the following weekend from the Best Recipe cookbook figuring that they’d knock it out of the park. Not so. They were too hard, presumably from all the sugar they called for and they completely omitted the cinnamon, replacing it with nutmeg (freshly grated, of course). We prefer our oatmeal cookies chewy and cinnamon-y, thanks. My point is that experts are merely people with experience enough to make the right decision most of the time. 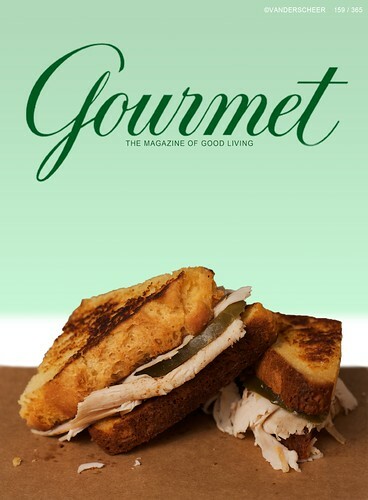 Mr. Kimball, Gourmet magazine failed because it decided it wanted to continue to be coffee table, doctor office and studio decoration instead of a digitally accessible information resource. Companies that don’t appreciate the shift in consumer culture will, unfortunately, be left behind.